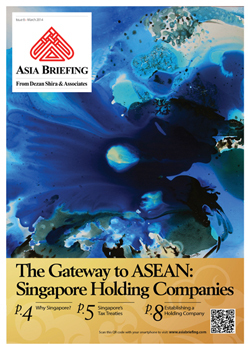 The newest issue of Asia Briefing Magazine, titled The Gateway to ASEAN: Singapore Holding Companies, is out now and will be temporarily available as a complimentary PDF download on the Asia Briefing Bookstore during the months of March and April. In a global economy dominated by industrial powers, the city-state of Singapore has carved out its competitive niche as a destination for regional headquarters, branch offices and holding companies. Featuring one of the most stable and business-friendly legal and tax regimes in the world, Singapore has long been the preferred location for foreign investors seeking to establish a holding company to pursue investments through the ASEAN region, China and India. In this issue of Asia Briefing Magazine, we highlight and explore Singapore’s position as a holding company location for outbound investment, most notably for companies seeking to enter ASEAN and other emerging markets in Asia. We explore the numerous FTAs, DTAs and tax incentive programs that make Singapore the preeminent destination for holding companies in Southeast Asia, in addition to the requirements and procedures foreign investors must follow to establish and incorporate a holding company. As ASEAN inches ever-closer to economic integration in the ASEAN Economic Community next year, Singapore’s imperative role as the de facto financial and commercial capital of Southeast Asia will be unassailable. Foreign investors should closely observe and anticipate Singapore and ASEAN’s ascension to the forefront of economic progress and development in Asia. The Gateway to ASEAN: Singapore Holding Companies is out now and immediately available as a complimentary PDF download on the Asia Briefing Bookstore for a limited time only. Dezan Shira & Associates is a specialist foreign direct investment practice, providing corporate establishment, business advisory, tax advisory and compliance, accounting, payroll, due diligence and financial review services to multinationals investing in emerging Asia. Since its establishment in 1992, the firm has grown into one of Asia’s most versatile full-service consultancies with operational offices across China, Hong Kong, India, Singapore and Vietnam in addition to alliances in Indonesia, Malaysia, Philippines and Thailand as well as liaison offices in Italy and the United States. For further details or to contact the firm, please email asia@dezshira.com, visit www.dezshira.com, or download our brochure. Dezan Shira & Associates’ Singapore business guide will provide readers with an overview of the fundamentals of investing and conducting business in Singapore. The 2014 edition explains the basics of company establishment, annual compliance, taxation, human resources, payroll and social insurance in the city-state, in addition to how a company established there can be used to conduct business in the wider ASEAN and Southeast Asian region. Are You Ready for ASEAN 2015? ASEAN integration in 2015, and the Free Trade Agreements China has signed with ASEAN and its members states, will change the nature of China and Asia focused manufacturing and exports. In this important issue of Asia Briefing we discuss these developments and how they will impact upon China and the Global Supply Chain. In this issue of Asia Briefing Magazine, we take a look at the various types of trade and tax treaties that exist between Asian nations. These include bilateral investment treaties, double tax treaties and free trade agreements – all of which directly affect businesses operating in Asia. In this issue of Asia Briefing Magazine, we examine the different tax rates in 13 Asian jurisdictions – the 10 countries of ASEAN, plus China, India and Hong Kong. We examine the on-the-ground tax rates that each of these countries levy, including corporate income tax, individual income tax, indirect tax and withholding tax. We also examine residency triggers, as well as available tax incentives for the foreign investor and important compliance issues. In this issue of China Briefing, we introduce the simplified company establishment procedure unique to the zone and the loosening of capital requirements to be applied nation wide this March. Further, we cover the requirements for setting up a business in the medical, e-commerce, value-added telecommunications, shipping, and banking & finance industries in the zone. We hope this will help you better gauge opportunities in the zone for your particular business.